A Strain Gauge is a device used to measure the strain (i.e., a deformation produced by stress) of an object. The most common type of strain gauge consists of a metallic foil pattern that is supported by an insulating flexible backing. The strain gauge is glued to the object. As the object is deformed, the foil is deformed, causing its electrical resistance to change as demonstrated in Figures 1–3. Strain gauges are often components of pressure sensors and load cells. Strain gauges are made from alloys that minimize the temperature effects on their resistance, eliminating the need for temperature-compensation circuits. Piezoresistors, which are semiconductor strain gauges, are preferred over foil gauges for the measurement of small strain values. However, these are expensive, more sensitive to temperature changes, and more fragile than foil gauges. A variant called a mercury-in-rubber strain gauge is used in biological measurements of blood flow or tissue swelling. Unfortunately, using strain gauge devices to obtain pressure images between two mating surfaces is cumbersome and tedious. Specifically, one must take multiple measurements across the surface and then estimate the pressure at locations where measurements were not taken. Fujifilm Prescale® can measure the entire pressure profile at once. 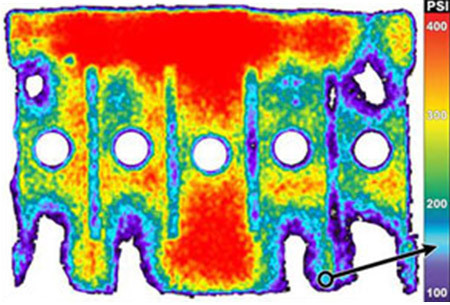 In these tests, James Meiselbach, a mechanical engineer at Futek, used Fujifilm Prescale®, pressure indicating film, to demonstrate that the clamping pressure fluctuated from 50 psi to upwards of 200 psi. Fujifilm Prescale®, a thin flexible film from Sensor Products, is a versatile non-destructive testing tool. The film has the ability to show inconsistencies in surface pressure between contacting surfaces as shown in Figure 4. This discovery led Futek to redesign several of its clamps to regulate the pressure more precisely.